We love Winter Weddings – crisp air, frosted foliage, candle light, and lots and lots of sparkle. If you’re planning a Winter or Christmas wedding, here is a selection of our favourite festive bridal hairstyles and hair accessories – all fit for a snow princess! 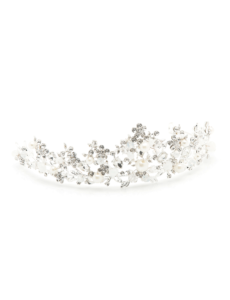 Following the Royal Wedding, twinkling tiaras are still firmly in the bridal spotlight. Winter 2018 is the perfect time to rock a glittering headpiece. As well as emitting maximum sparkle, tiaras add the perfect finishing touch to winter wedding outfits and look enchanting paired with faux fur capes and velvet stoles. 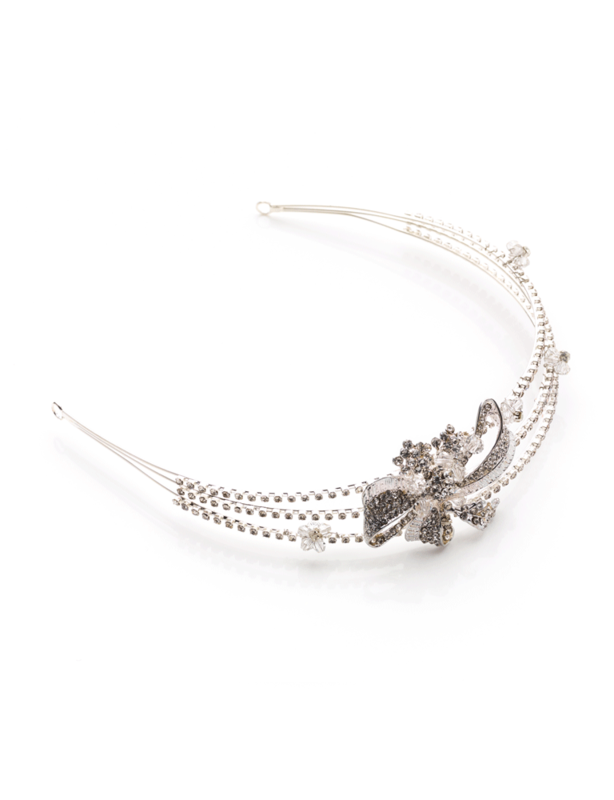 Tiaras are also extremely versatile and can be worn with a pretty veil or as a stand-alone piece, for example, framing soft waves or encircling an elegant up-do. 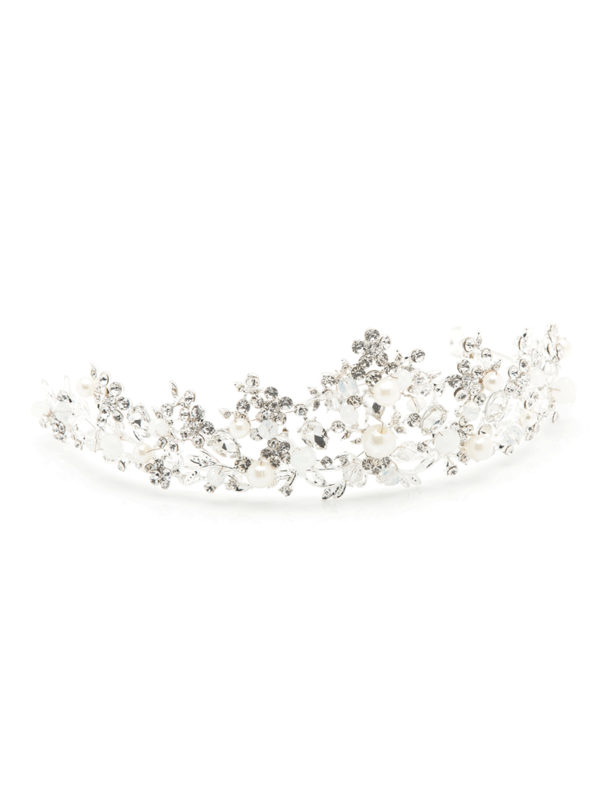 If you’re planning a winter wonderland wedding, take a look at our show-stopping silver Hailey Tiara Crown encrusted with crystals and white pearls. Our Cecile tiara’s princess-style design is straight from a winter fairy-tale. Comprising silver scroll pattern covered with tiny Austrian crystals, it exudes timeless elegance. Tiara Tip: Choose a style that suits your face shape. If you have a longer face, a high, pointed tiara will emphasise this, so opt for lower, single row designs. Equally, if you have a rounder face, a tiara that peaks at the centre will lengthen and accentuate your profile. Bridal headbands and hair vines add subtle sparkle to winter wedding hairstyles. Unlike tiaras which sit on top of the head, headbands and hair vines fit snuggly to the crown. They can also be threaded through hair sections for a relaxed, romantic feel. 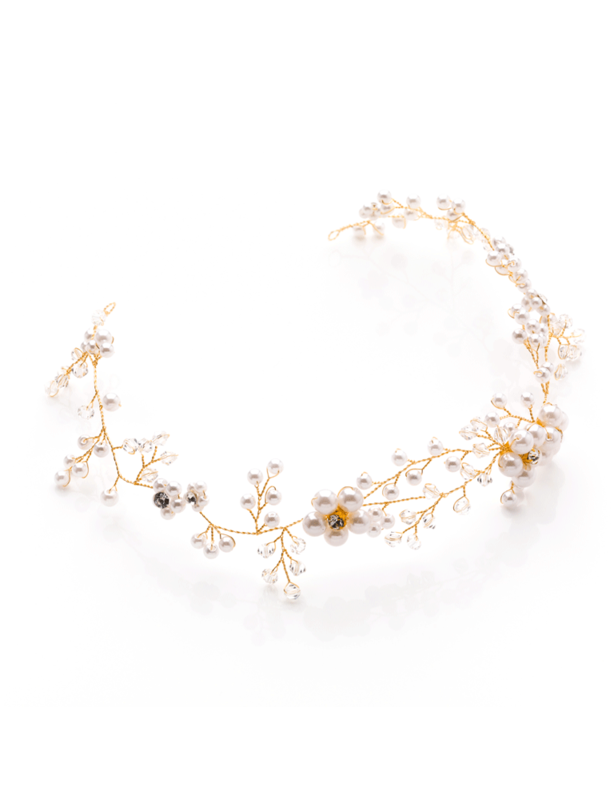 Silver headbands with white and crystal details reflect the season’s wintry feel, while rose gold infuses warmth. 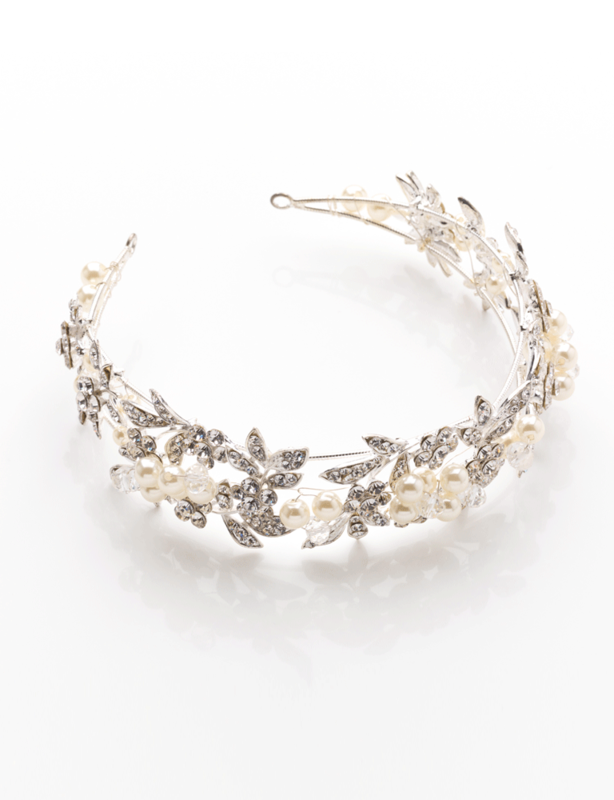 For a crisp, snow white look, try our silver Amelia headband with swirls of rhinestone covered leaves and pearl clusters. Rose gold is a stunning colour accent for candle-lit nuptials. Our best-selling ribbon-tied Flora headband with rose gold flower motif is a firm favourite with winter brides and suits all length hair. 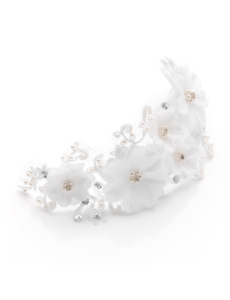 For an entrance to remember, try our fabulous Fleur bridal headband . Made with white fabric flowers, crystals and pearls this is a true bridal crown – perfect for Snow Queens! 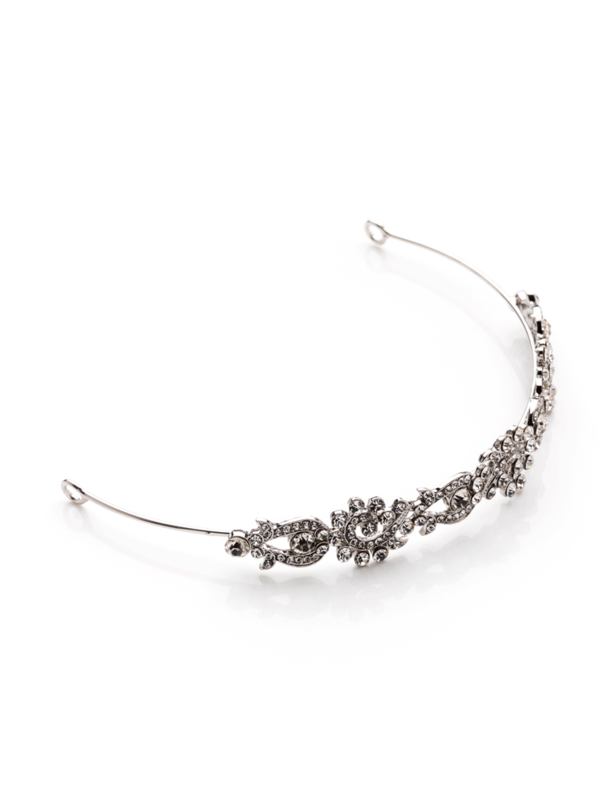 Another frosted favourite is our dazzling Bryony headband with side bow and crystal flowers. Florals are big in bridal right now. 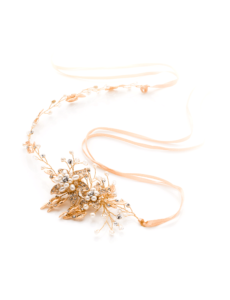 Our Collette hair vine comprises delicate rose gold branch and petite crystal and ivory flowers, capturing the theme perfectly. The beauty of this design is not only in its timeless aesthetic but in the many ways it can be worn – across the head with a central parting for a classic bridal look, in a halo with a veil pinned at the back or entwined in loose braids for a laid-back feel. 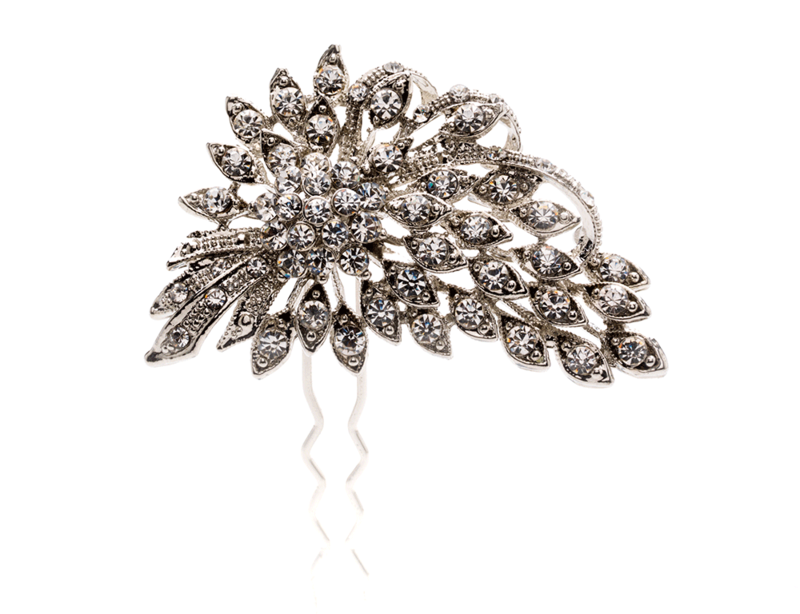 If a headpiece isn’t your style, add subtle sparkle to your wedding hair with hairclips and hair pins. Delicate single hair pins finished with clear crystals, such as our Valeria hair pin are stunning tucked into chignons and up-dos. 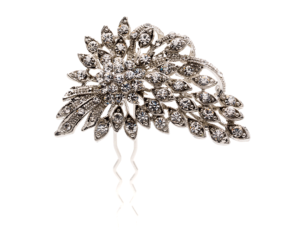 While our vintage inspired Evelyn hair clip , set with hundreds of miniature crystals, makes a gorgeous focal point. Looking for the perfect winter bridal accessories? We really like your website, it has engaging articles, Thank you!